The following data and statistics are sourced from various reports published from time to time by the Directorate General of Civil Aviation (DGCA), Ministry of Civil Aviation, India. DGCA is the regulatory body in the field of Civil Aviation, primarily dealing with safety issues and responsible for regulation of air transport services to/from/within India and for enforcement of civil air regulations, air safety and airworthiness standards. The domestic passenger traffic registered a compound annual growth rate (CAGR) of 9.89% during the period 2007-08 to 2016-17 while the international passenger traffic grew at 8.07% (CAGR) during the same period. 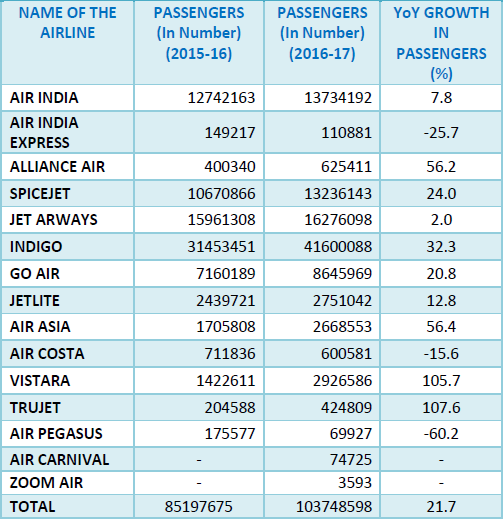 The high growth of 21.77 % in the total domestic passengers during 2016-17 is mainly due to the high growth in passengers carried by IndiGo, SpiceJet, Vistara and Go Air. The domestic cargo traffic registered a growth of 6.3% (CAGR) over the period from 2007-08 to 2016-17 while International cargo traffic grew at 4.4% (CAGR) during the same period. Scheduled Carriers are the Persons or Air Transport Undertakings who are operating any Scheduled air transport service from, to, in, or across India with the permission granted by the Central Government. Sub-rule (9A) - "Air Transport Undertaking" means an undertaking whose business includes the carriage by air of passengers or cargo for hire or reward. Sub-rule (49) - "Scheduled air transport service" means an air transport service undertaken between the same two or more places and operated according to a published time table or with flights so regular or frequent that they constitute a recognisably systematic series, each flight being open to use by members of the public.